It’s the question everyone seems to ask when there’s a baby on the way – ‘do you know what you’re having?’. 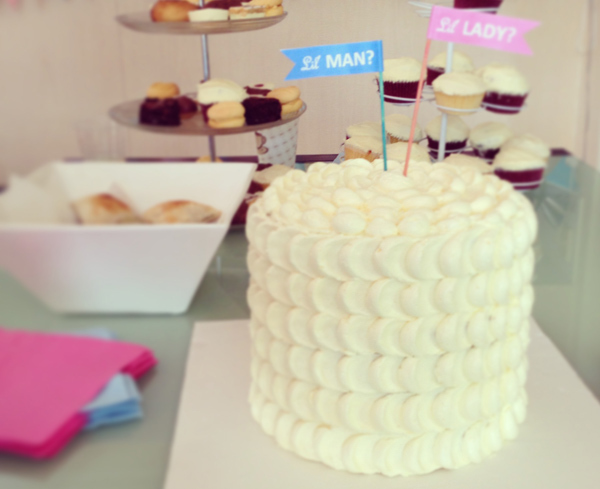 Mum-to-be Elise answered the gender question in a most original way at her baby shower. Elise asked her doctor to write the baby’s gender on a piece of paper and seal it in an envelope when she visited for her twenty-week scan. The envelope was handed with much fanfare to a cake-making family friend who, after being sworn to secrecy, baked an amazing torte with the crucial information concealed inside. All that was left was for family and friends to join Elise and husband Tony at their baby shower as they prepared to discover whether their much-longed-for third child – they already have a son and a daughter – would be a boy or a girl. While baby showers are usually a mostly female affair, Tony was determined to be right in the thick of things for the big reveal of their third child’s gender, sticking around to help his wife cut the cake. And the answer? 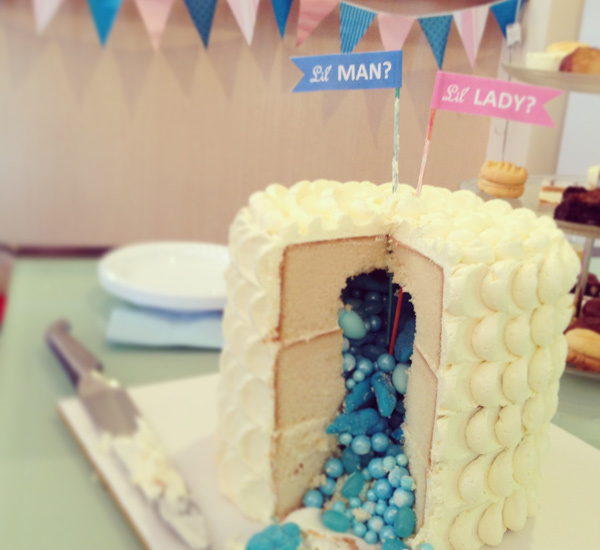 Out came an avalanche of blue lollies – it’s a boy! Terribly adorable in every way, we also like the other touches at this low-key gender reveal baby shower, like how the guests grabbed their own lil’ man or lil’ lady flags to stake their guess just before the grand cutting of the cake. Elise and her sister Monique made the invitations themselves, using ribbons and embellishments from Spotlight, while the striped paper came from Paper Perfect and the baby feet brads from Eyelet Outlet. 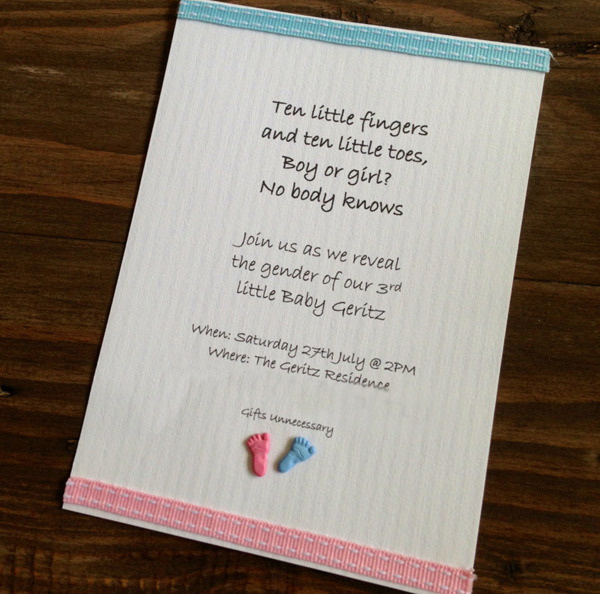 I love how they used a line from Elise’s toddler daughter Shylie’s favourite book – Mem Fox’s Ten Little Fingers and Ten Little Toes – to start the invite. 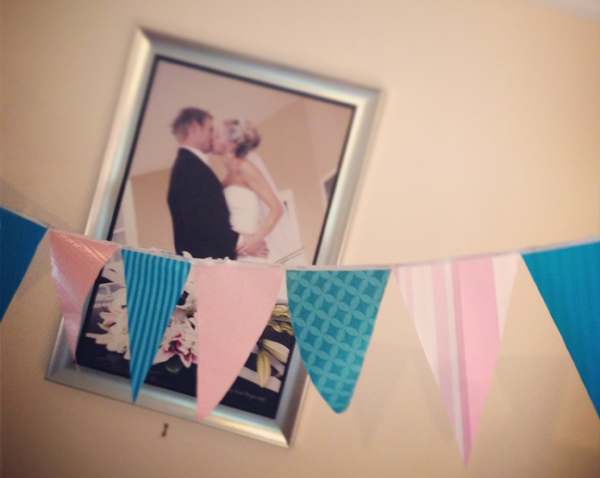 The sisters also made the pretty pink and blue bunting that stretched out across the room, using patterned gift wrapping paper and ribbon found at Barama. On the food front, apart from that way-impressive gender reveal cake, Elise cheerfully admits that almost all the other food came from the freezer section of Coles. Elise, we love your honesty! Guests were also treated to a selection of special teas from McIver’s and T2, including Madagascan Vanilla and Mango Chilli.